Since 3 years ago, volunteers have been serving tourists at Sanya No. 1 Market during the Spring Festival. 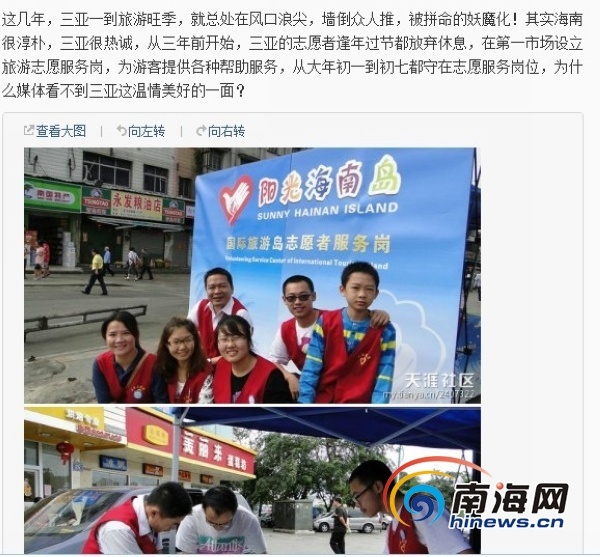 According to netizen "Bapo Amelie", the volunteers are members of the Happy Volunteers’ League which was founded 3 years ago and its members include students of Hainan University Sanya College and Qiongzhou University, business managers, government officials and ordinary workers. During the yearly week-long traditional Chinese New Year holiday, six to ten volunteers will work at Sanya No. 1 Market to provide tourists with many services for free including tour guide services, luggage storage services, maps of Sanya city and some emergency services.